June 18, 2012 - The Air Force's unmanned, reusable space plane landed in the early morning of June 16 at Vandenberg Air Force Base, Calif., a successful conclusion to a record setting test flight mission that began March 5 from Cape Canaveral Air Force Station, Florida. The X-37B Orbital Test Vehicle, one of two such vehicles, spent 469 days in orbit to conduct on-orbit experiments, primarily checkout of the vehicle itself. "The vehicle was designed for a mission duration of about 270 days," said Lt. Col. Tom McIntyre, the X-37B program manager. "We knew from post-flight assessments from the first mission that OTV-1 could have stayed in orbit longer. So one of the goals of this mission was to see how much farther we could push the on-orbit duration." Managed by the Air Force Rapid Capabilities Office, the X-37B program performs risk reduction, experimentation, and concept of operations development for reusable space vehicle technologies. 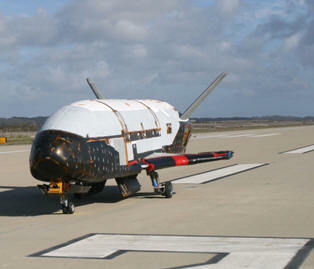 The X-37B mission is the longest space mission only after the NASA Discovery shuttle program. The Air Force's unmanned, reusable space plane landed in the early morning of June 16 at Vandenberg Air Force Base, Calif., a successful conclusion to a record-setting test-flight mission that began March 5 from Cape Canaveral Air Force Station, Fla. The 11,000-pound state-of-the-art vehicle, which is about a fourth the size of the shuttle, allows space technology experts to continue sending up experiments, with results returning safely to Earth for study. "With the retirement of the space shuttle fleet, the X-37B OTV program brings a singular capability to space technology development," McIntyre said. "The return capability allows the Air Force to test new technologies without the same risk commitment faced by other programs." The vehicle was initially a NASA initiative, but was transferred to the Defense Advanced Research Projects Agency in 2004. When it first launched in 2006, it was lauded for its cutting-edge technologies, such as the auto de-orbit capability, thermal protection tiles, and high-temperature components and seals. "The X-37B's advanced thermal protection and solar power systems, and environmental modeling and range safety technologies are just some of the technologies being tested," said McIntyre. "Each mission helps us continue to advance the state-of-the-art in these areas."